Before we get to that answer, let's go over Yelp Deals a little bit more. While you'll see "Check-In Offers" from time to time on business listings, that's not what we're talking about here. Yelp Deals, as well as Gift Certificates, are offers you pay up front for that saves you money. For example, spending $25 to get $35 credit at a restaurant. After purchasing a Yelp Deal, the voucher will be emailed to you, which you can redeem at the location at a later time. 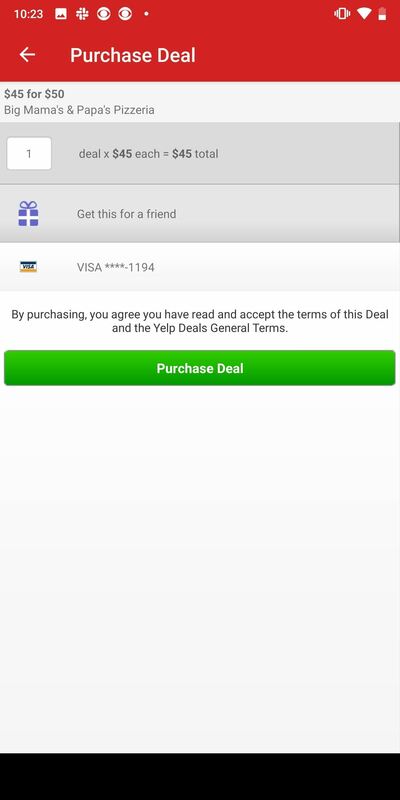 You can also access your Yelp Deals and Gift Certificates from the Yelp app on your iPhone or Android phone, which can be found in the "Deals & Offers" section for your account. Typically, Yelp Deals can save you around $10 to $25, which is great if you know you're going to spend at least the total amount of the deal. (Unused portions are not returned or credited.) Best of all, Yelp makes it easy for you to find these deals when you're looking at restaurants to eat at or bars to get tipsy at. As you can tell with the "Method" headline here, there are multiple ways to find Yelp Deals. This first one will only show you Yelp Deals around your current location, and for some reason, it only applies to iOS, not Android. 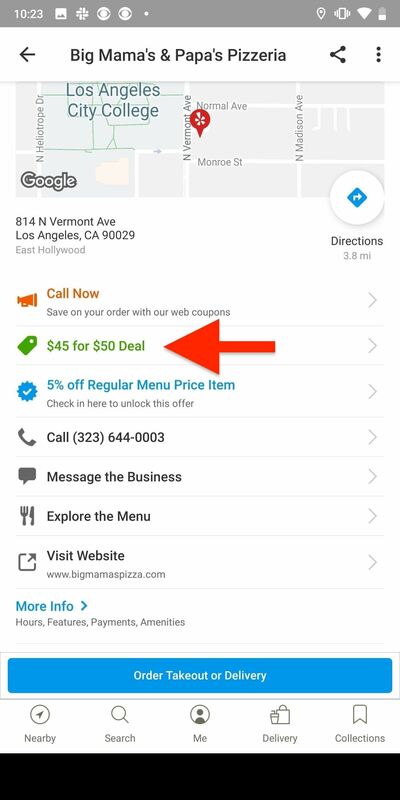 On your iPhone, open up the "More" tab in the Yelp app, then select "Deals & Offers." Under the "Current Deals" tab, you'll see all of the nearby businesses offering Yelp Deals, as well as a quick snippet of what the deal will give you. Tap on the location, then on the deal underneath the map, which will give you more information about the requirements, what you get, and how to buy it. The next method is just as easy as the one above, and it applies to both iOS and Android. On Android, select the "Nearby" tab, and on iOS, select the "Search" tab. Next, tap "More" in the list of categories, then select "Deals." You'll immediately see a list of all the businesses offering deals in your location. You can tap on "Current Location" in the search bar to change the location to any city you want. Alternatively, you could also just hit the search bar from the "Nearby" or "Search" tabs on Android, as well as the "Search" tab on iOS, and set the location to whatever you want. Next, type in "Deals," then tap on the "Deals" result. You'll see the same results as by browsing from the categories list. For the last method, search for a type of business from the "Nearby" or "Search" tab. You could type in the topic yourself or select from the list of categories. You can also search for nothing, leaving the search bar blank. Either way, after performing the search, tap on the "Filters" icon (two sliders). You can also tap on "All Filters" at the end of quick filter buttons if it's there (it won't always be). On the Filters page, toggle on "Offering a Deal," and then hit "Search." A new list of businesses will appear on the page, all of which have deals you can purchase. Now that you know how to find all the deals, tap on a business to learn more. Under the map, tap the deal with the price tag icon. If you don't see the deal for some reason, even though it was listed in the search results, it's a common bug in the Yelp app. In those cases, perform a search for that exact business instead, and when you open the listing, you should see it. In the example deal below, it says "$45 for $50 Deal," which is a 10% discount. This page will also show more details, such as what you get, total savings, how many vouchers you can use at a time, restrictions, and the fine print for actually using the deal. No matter what, all Yelp Deals need to be used within one year after purchase. After a year, you can only redeem the voucher for the amount you paid, not the amount the voucher is for. If you want to purchase the deal, tap on "Buy Now," select a payment option, and hit "Purchase Deal." You'll receive an email with your voucher as soon as the transaction is completed. 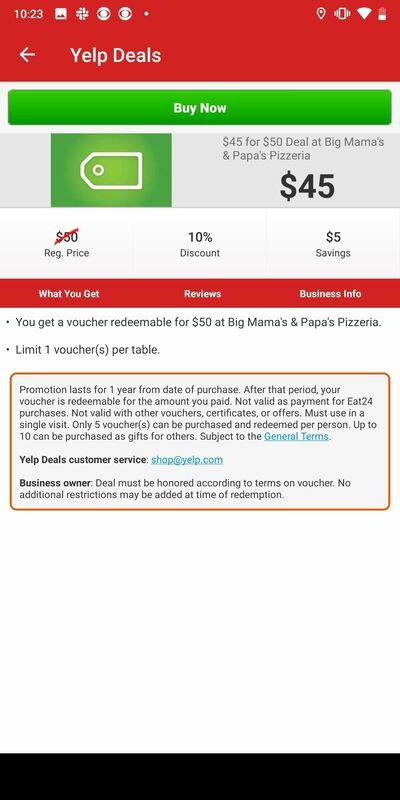 You can also view your voucher in the Yelp app. On an iPhone, select the "More" tab, then "Deals & Offers," and select the "My Deals" tab, and your voucher should be listed there. On Android, tap the "Me" tab, then select "My Deals & Offers." Once you get your redemption code, you can use your voucher at the business. You can print it out or just use your Yelp app. A Yelp Deal can only be purchased from Yelp, so don't purchase any potential "deals" from any third-party websites. Yelp Deals are currently only available in the US and Canada.